No silver bullet itinerary will spark a true appreciation for New York City. Gastronomes will make reservations at all the hits, aesthetes will wind through museums and galleries, and denizens of social media with something to prove will parade around Times Square, the Empire State Building, and maybe the Statue of Liberty. Visitors are naturally drawn to the highlights, the history, the structures of the city. But there is only one thing that will imbue even one day here with inimitable authenticity: a subway ride. The subway is the most iconic, accessible attraction we have. It’s our premier people-watching spot. At the end of the day -- or rather, all day long -- millions of people from every pocket of society navigate a system where the rules are simultaneously never-changing and constantly in flux. It’s like a cocktail party where everyone’s invited and only half of the guests are drunk. 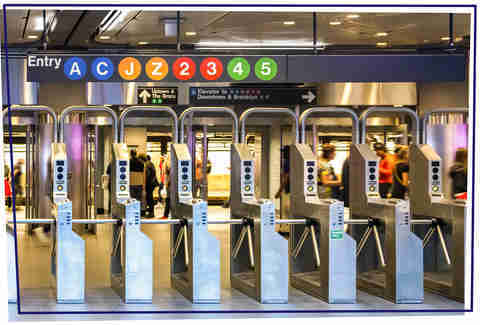 And you haven’t really experienced New York City unless you’ve swiped a MetroCard, whirled through the turnstile, and grasped a pole to mitigate the sudden twists and turns that can make getting to your destination feel like a tightrope walk in high winds. When everyone is making all the right moves, your ride will resemble an immersive, human Rube Goldberg machine: the train comes to a stop; anyone huddling in the doorway steps aside; passengers exit before new ones board; folks move all the way into the car; backpacks slip off, and those who can give up their seats do so without calling attention to it. It’s the city in action at its unstudied best. Barring injury or illness, New Yorkers have precious few reasons to forgo the train in favor of its alternatives. When we’re so hungover that life has lost all meaning, we whistle down a taxi. When we have to transport a gaggle of visiting family members, we tap up an Uber. When we must make it across town in madcap fashion to catch the Hampton Jitney and stop the love of our life from absconding to North Fork with our professional nemesis, it’s pedicab time. But, in almost all other situations, we go underground. And so should you. Keep your wits about you like always, but don’t worry too much about any weird, wild subway stories you may have heard. Tales of pizza-stealing rats and much worse criminal activity are newsworthy because they’re relatively uncommon. You’re much more likely to catch a glimpse of whimsical mosaics worth making an extra stop for, impromptu poetry readings, gravity-defying dancers, and unexpected free performances by the jazz bands, wind quintets, gospel singers, acoustic acts, doo-wop groups, mariachi bands, and violin, cello, mandolin, steel drum, flute, accordion, and didgeridoo players who bring a little levity to everyday delays -- and might just inspire you to give a buck or two. 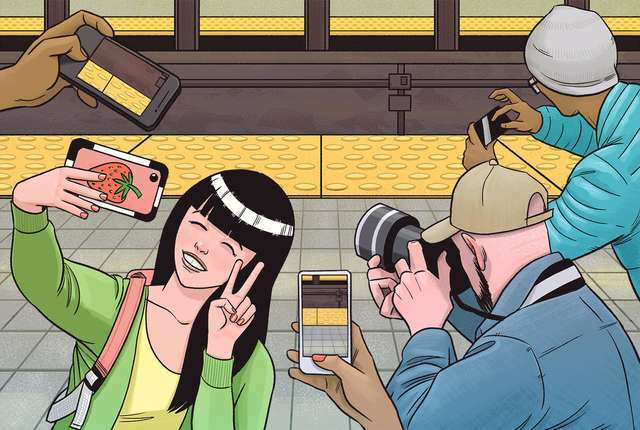 Since most of us haven’t exactly chosen the commuter life, a typical trip is relatively peaceful -- everyone’s just trying to get where they’re going more or less unscathed. We politely ignore each other to the point where I once sat beside a good friend for eleven stops before either of us noticed. It might sound bleak at first blush, but that indifference makes the subway a judgement-free zone where you can be your truest self and nobody will blink an eye. It’s the apex of the old high school guidance counselor ethos: everybody is too busy worrying about themselves to worry about you. Unless you’re overheard asking for directions -- then you’ll have everyone in earshot pontificating on possible routes. The subway is also one of the only places in town where most folks are working together to uphold the same basic standards of conduct. Above ground, plenty of people will eschew basic decency and try to leapfrog you for a table at a restaurant, fling a car door open without checking the mirror, or say you look like a celebrity 20 years your senior. Just think about walking three abreast on the sidewalk and they’ll mow you down just as soon as look at you. But on the subway, we lean in. Literally -- it’s lean or get nudged. On the subway, nobody with any sense wants to block the doors, take a seat when someone might need it more, or end up a meme star for failing to remove a backpack. We aren’t following the dulcet, disembodied etiquette lessons that repeat over the train’s (sometimes audible) speakers -- courtesy is contagious -- merely because it’s embarrassing to be the backpack jackass, but rather because we’re quietly looking out for one another. New Yorkers will use their newly shined shoes or bare hands to try to stop the mechanical doors from closing when they see someone who’s sprinting to catch what feels like -- and sometimes is -- the last train out of Dodge. 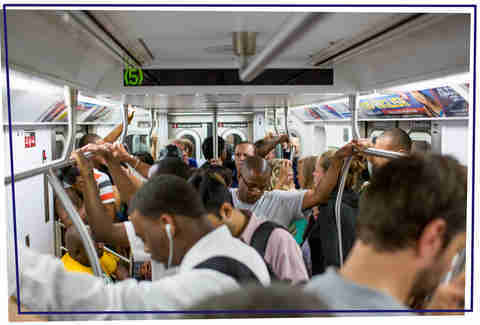 Folks wrestle with steel doors even as conductors implore them not to, because we all know what it feels like to have left the house early and still wind up late to a job interview, a doctor appointment, or to pick up a kid. We’ve all had to take the gamble that the next train might show up in time to get you there -- or it might not. The breathless latecomer to the train car who has just single handedly held up hundreds or possibly thousands of people will draw eye-rolls, but we’ve all been that person. And even though their successful sprint adds one more silhouette to a car that’s already full to bursting, it’s that shared experience -- no matter who you are, no matter what stop you’re getting on at -- that keeps us from killing each other. Try to get a sense of the New York state of mind anywhere else and you’ll get the filtered version: cool kids trying to impress the bartender at a pseudo-speakeasy; wellness freaks out-Gooping each other in the park; whatever it is super rich people do at their super rich people places. For a first or even third-time visitor just trying to have a good time, these tropes can be annoying at best and intimidating at worst. How’s anybody who doesn’t already know supposed to divine the secret code to get into that unmarked, underground bar? There are no secret codes to the subway. And it doesn’t just cut New Yorkers down to size, it equalizes all-comers. We’re all somehow the most ourselves when out of our chosen elements, hurtling through hollowed-out earth. New Yorkers know it’s pretty much us vs. the subway. The only way to combat a non-stop monolith intent on sending three consecutive “trash trains” in a row after happy hour turned into happy hours and you’re waiting on a platform at 2:30am is to get along with each other. Because when the system doesn’t work, it’s pretty bad! Fares rise even as the infrastructure crumbles, sometimes there are literal garbage fires in the tunnels, and the whole operation often seems better suited to rat dance parties than human commuting. But most subway blunder stories follow the same forgettable track: “Even after I left home [early/on time/barely half an hour late], traveling [some relatively negligible distance] took [forty-five minutes/an hour/some wildly exaggerated period of time that strips the whole account of any credibility] longer than it should have... but I got here, I guess.” Everyone always eventually gets there. When the subway is running at its full potential, absent the nebulous “train traffic ahead,” or “signal malfunctions” that make a typical trip worthy of an angry tweet, you’ll get there pretty quick, too. Some locals, usually the mired-in-delusions-of-Old-New-York-grandeur-types, will swear up and down you’ll travel faster in a car. Just take a cab, they’ll say, as though their insolent “just” were a magic word switching every taxi light on, bestowing divine shortcut knowledge on drivers, cutting the meter when you’re moving so slow pedestrians are passing you by, and turning bridge and tunnel traffic into helium balloons. Do not be tempted by this siren song. Be bold, and take the subway. 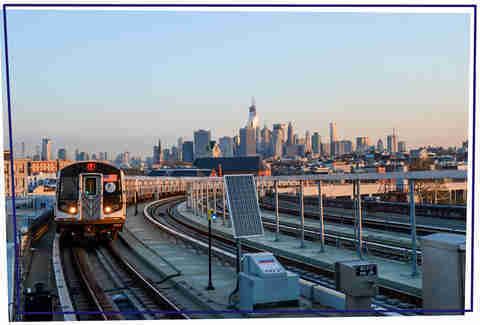 On a letter or numbered line, heading uptown to downtown, east to west, and into the outer boroughs, the subway is a means to an end. And in New York City, it’s the best one we’ve got. Every commute has its problems, but every line also has its dazzlers. The elevated Smith-9th Street stop on the F/G has one of the best views of the city. If you take the downtown-bound 6 beyond Brooklyn Bridge/City Hall, you’ll pass through a beautiful abandoned station. And Hoyt-Schermerhorn, which hosts the A, C, and G trains, is just kind of fun to say. The subway is a memory-making machine. It’s a place where marriages have been officiated, where lives have begun, where you might just share a seat with Carrie Bradshaw, herself, and where, even if you’ve only paid the price of admission once, you’ll leave with your very own tale to tell. Sure, weddings, births, and errant celebrity sightings are as rare as the screaming, cautionary headlines on the opposite end of the transit news spectrum. 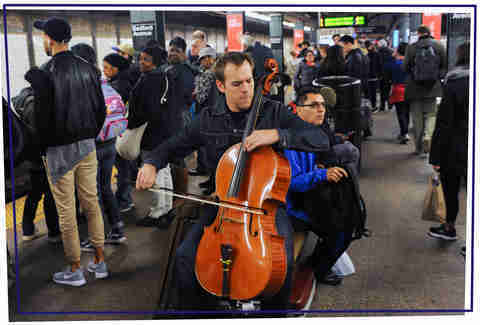 But when an obvious tourist or apparent recent transplant successfully swipes through the turnstile on the first try, pauses to applaud a busker, or perks up when the train pulls into a station adorned with an unexpected work of art, it reminds us to take a moment to appreciate those things, too. As long as everyone stands clear of the closing doors.